Rosières is a story of passion for the art of cooking. For over 150 years, it has been designing and producing cooking appliances created to enhance the culinary talents of its consumers. Award-winning chefs, such as Paul Bocuse and Jean-Jacques Daumy, collaborate with the brand, promoting the skill, experience and bold character expressed by all the products in the range. In this way, to the delight of all generations, Rosières is helping to pass on the valuable culinary experience of France. First and foremost, Rosières embodies the spirit of French excellence, renowned worldwide. For 150 years, Rosières has been designing and improving its products in collaboration with leading chefs and cooking schools. Each time you cook, put our products to the test. They have been designed to ensure that you are never disappointed. Rosières is a specialist in the built-in electrical appliance sector, leads the French market in terms of image and experience in the cooking segment. For over 150 years, it has been driven by its “passion for cooking”, a concept that has become the brand’s trademark. It joined Candy Group in 1987. A village in Berry, France is where the brand’s know-how and authenticity originated, but it was only in 1869 that the Rosières we know and love today began to take shape. 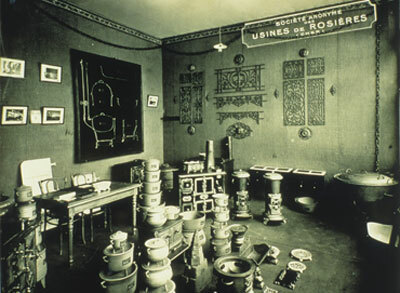 That was the year when Jules Roussel, who was already the owner of the Forge, bought the Rosières property. Roussel modernised the foundry and launched new products in cast iron. Upon his death, a limited company was set up by his heirs and engineers. In 1909, Henri Magdelénat developed the production lines, and reshaped and enlarged the foundry and the assembly and supply departments. He also opened a new enamel and cast-iron enamel department, manufacturing products of a quality soon to be acknowledged by all. Additionally, Magdelénat created a new product design department: in particular for enamelled finish kitchens and wood and coal-burning stoves. In 1934, Rosières was awarded an exclusive licence for France and other countries to sell the famous AGA kitchens, invented by the Swedish Nobel prize-winner Dalen. AGA Véritables is equipped with heat accumulators which, thanks to continuous combustion, guarantee uninterrupted running on only 4 or 5 Kg of fuel per day. When used in conjunction with AGA water heaters, these cookers can heat the water for an entire household. Their manufacture will continue until 1966. The years 1938-1940 are best known for cast iron and cast-iron enamelled cookers ; gas cookers were to replace the previous models. A vast plan of modernisation, product innovation, the setting up of an export network and the continuous renewal of the manufacturing side are all proof of the quest for perfection that is the characteristic of this brand. From the cast iron cookers of the past to the technological revolution, Rosières has built up a unique identity, a subtle alchemy between modernity and tradition, solidity and innovation. It has set many records over the years: the first ever red enamelled kitchen launched in 1972, the creation of ultra-flat hobs, a world exclusive launched in 1977. In 1985, the company joined forces with Paul Bocuse, the designer of the famous Rosières Bocuse professional kitchen; Rosières products have also won many prizes, such as the “Janus de l’Industrie” award presented to the Magis oven in 1988 and the 2010 Design Award for the Ghisa hob made in a single mould. In the new millennium, Rosières began developing vast, complete collections that enabled it to offer matching appliances in the kitchen, such as the Creatis in 2001, the Signature in 2004 and the Prodige in 2011. Today Rosières aims to support the French gourmet market so that its tradition can be handed down to future generations in the form of unique products made with fine materials. Its ambition is to convey and share the experience it has gained over the years and to embody a lifestyle, by offering the finest technology to complement the talent of its consumers.